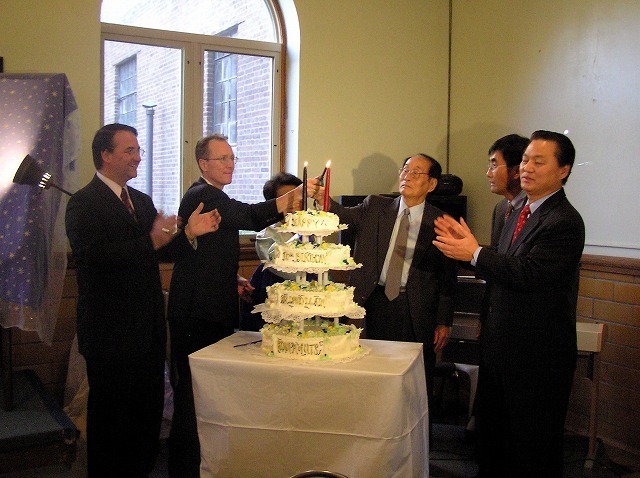 On Saturday, November 12, Unification Theological Seminary hosted a joyous "National Celebration" honoring Dr. David S.C. Kim, the Seminary's first president, on his 90th birthday. Some 160 guests packed the UTS main dining hall including North American Continental Director Dr. Chang Shik Yang (UTS '96); American FFWPU President Michael Jenkins (UTS'77); past and present UTS administrators, faculty, staff and students; and friends from as far away as Portland, Oregon. Mrs. Eui Hong Kim, Dr. Kim's wife of sixty-three years and former UTS "First Lady," was by his side, as always, supporting her husband and Mr. Hyun Soo "Harry" Kim represented the Kim's four sons and one daughter who provided the delicious Korean lunch. The three-hour luncheon included innumerable highlights. The first was an impressive thirty-minute documentary, "Let Us Celebrate Our Past and Look Forward to the Future: A Tribute to the Work of David S.C. Kim." Alternately humorous and touching, the film covered Dr. Kim's public work in America from 1972-1994, mainly focusing on his activity as the founding president of UTS. Milestones such as the Seminary's inaugural convocation and first commencement exercises came to life in the video as did memories precious to a generation of seminarians such as President Kim's "fireside chats," oratorical contests, and visits of Rev. Moon. A complete two-hour version of the documentary, edited by Yuichi and Jennifer Tanabe, is available from IOWC for $40 c/o Susan Herrman, 30 Seminary Dr., Barrytown, NY 12571 (shhananim@yahoo.com). Dr. Chang Shik Yang's congratulatory remarks to Dr. Kim, which included his reading of a tribute from Rev. Chun Hwan Kwak, International Chairman of FFWPUI, were a second highlight. Dr. Yang noted that Rev. Kwak wrote on behalf of Rev. and Mrs. Moon, then in Mali, Africa, who were "remembering" the day. In one of the luncheon's most moving moments, while reading Rev. Kwak's words of how President Kim had attended True Parents from the beginning of the movement and how his "great achievements" had brought them "comfort," Dr. Yang was overcome with emotion and had to pause. Dr. Yang termed President Kim a "historical treasure of our movement" and led all participants in a bow to him which he said was customary in Korean tradition on such occasions. Though noting that 90th birthdays were rare and that he, in fact, had never attended one before, Dr. Yang "as a Korean younger brother" expressed confidence that he would attend a 100th birthday in ten years, given President Kim's "incredible energy." Mr. Hyun Soo Kim, Dr. Kim's second son, spoke brief congratulatory remarks which offered those attending insight into the Kim family. After joining the Unification movement in early 1954 and being one of the early members with Rev. Moon at the founding of HSA-UWC, Dr. Kim became its first overseas missionary, to England and Wales (1954-55). He then worked full-time in Seoul Headquarters before departing for the United States in 1959, leaving behind his family who could not join him until 1970. In words that testified to the family's sacrifice and offering, Hyun Soo stated, "My father loves his spiritual brothers and sisters more than his biological children. You know that. I do not have any complaint [about this] but [only] respect." The remainder of the luncheon turned into something of a heavenly banquet love-fest. Dr. Kathy Winings, the luncheon's emcee, read a selection of greetings and congratulations from those unable to attend, including Dr. Shimmyo, the seminary's second president, and Dr. M. Darrol Bryant, who credited Dr. Kim with setting him on his life's course in interfaith reconciliation. Dr. Hendricks, Dr. Mickler and Dr. Wilson presented Dr. and Mrs. Kim with a 2' by 3' framed portrait of them both standing on the front circle on Commencement Day, 1985, which will hang permanently at the Seminary. Dr. Yang and Rev. Jenkins then presented a beautiful trophy and plaque on behalf of the American movement. There were songs, including such President Kim favorites as the "Belvedere Song," sung by everyone, and "Edelweiss," sung by ___. President Jenkins offered a toast, and tables dismissed individually for the wonderful buffet lunch during which there was an open mike for testimonies. Numerous brothers and sisters took advantage of this, each "filling-in" gaps and offering unique slants on President Kim's career and lives he touched. Farley Jones offered congratulations on behalf of the Seminary Board. Dr. Wilson offered thanks on behalf of the Seminary faculty, the many scholars President Kim touched, and the couples he married including his own. Others thanked President Kim for suggesting their matches. Martin Porter noted President Kim's role with the International One World Crusade and Joy Pople remembered spiritual warfare in which as a bus-team commander, President Kim protected his "heavenly soldiers." There were remembrances of another kind of warfare (actually, fun) on the UTS tennis court. Randy Remmel and Phillip McCracken gave testimony of their efforts to attend President Kim, Randy by maintaining President Kim's original mission house in Portland, Oregon and Phillip by assisting the Kims at their Poughkeepsie, New York residence. Dr. Dietrich Seidel offered thanks on behalf of the Seminary's original faculty, including those deceased whom President Kim always remembers. Others expressed appreciation for President Kim's hospital visits or support when they had serious health problems. HSA Controller Eric Holt offered thanks for handmade birthday cards which always included words of inspiration and, "most importantly," twenty-dollar bills. President Kim's remarks were the final highlight of the celebration. After expressing thanks for a well organized, comprehensive program, he launched into a trademark "Kingdom-building" discourse. Replete with references to spirit world, psychology, America's current crop of Sunday morning evangelists, Unification optimism, East-West relations, and ideal families, President Kim's core message concerned leadership. As the only-son of an only-son and, thereby, predisposed to get what he wanted and not follow instructions, President Kim stated that his leadership style was to figure out what Rev. Moon wanted ahead of time. He said that he was not a leader "waiting for instruction" as then it was "too late." This, of course, required spiritual sensitivity. Nevertheless, in this vein, he advised all present to be "thinking" leaders, not "blindly-following" leaders. After his remarks, President Kim passed out several of Professor Young Oon Kim's books as gifts which, he said, would please her. He concluded with a short Hoon Duk reading from True Parents' world speaking tour after which he led guests in singing "Hand-in-Hand" and final manseis. There was still time for photos in the Seminary's front circle. On leaving, everyone remembered once again why they like David S.C. Kim.